Dr. Lee Ae-ran (North Korea) — Women struggling for human rights"
Dr. Lee Ae-ran defected from North Korea to the South and remains determined to bring the two halves of the country together. BORN IN NORTH KOREA — a country plagued by recurring food shortages—Lee Ae-ran was a food inspector before escaping in 1997 to the South where she became the first female defector to earn a PhD, specializing in food and nutrition. And that’s only part of her story. 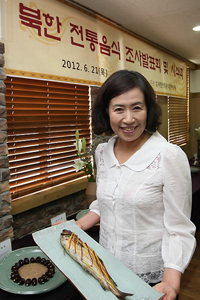 Lee Ae-ran founded a traditional cooking institute in Seoul in 2009, and now runs a North Korean restaurant. She was the first North Korean defector whose name was placed on a list of National Assembly candidates under South Korea’s Proportional Representation System, but was unable to secure a National Assembly seat as her political party did not get enough popular votes. “I am one of those displaced people from North Korea. I feel obligated to represent them,” she said at the time to the South Korean publication Daily NK. She also worked with the North Korean Youth Christian Meeting, a group dedicated to assisting defectors in difficulties, and she is involved with efforts to connect refugees with people who can provide financial stability. Today she dreams about reconciling the North and the South, separated since 1948, around the dinner table. “We can all start the day with a meal at the same table, with foods from both Koreas,” she told the Christian news network CNB in an interview in 2013. Dr Lee is driven by a deep-felt need to help others that may be a legacy of having suffered so much herself. Born in Pyongyang in 1964, Lee was just 11 years old when her family was banished to a re-education prison camp in North Korea’s harsh Northern Yanggang Province because her grandparents had defected. She thought she could rise above the persecution by studying hard, but to no avail. The Kim Il Sung regime forbade labor camp detainees from applying to college and conditions were so harsh that she once drank agricultural pesticides to end her life. It took a change of policy for her to be able to apply for college, and she chose “food and nutrition” as a major. She explained later that her choice was based on a wish to help those who did not have enough to eat. She then married a medical doctor and started a family. But news came out in a book published overseas that her father had opposed Kim Il-Sung in the early years of the regime. Lee knew all too well what that would mean in terms of retaliation. She chose to defect with her parents and her 4-month old baby boy. In all, nine members of her close family defected, leaving behind her husband, who was not informed of the plan. After a three-month trek through China and Vietnam, the family arrived in South Korea in December 1997. The many cultural differences they encountered were a shock. “It is tough to live in a capitalist country, because with this come many responsibilities,” she said. To support her family, she was successively a bathroom cleaner and an insurance salesperson before going back to school at the Ewha Women’s University in central Seoul as a food and nutrition major. She subsequently became a university professor in nutrition. “I especially wanted to remove for my child the sense of inferiority that comes from all the limitations that are applied to everything for being in the North Korean defector category,” she explained. She also became a strong advocate for North Korean women defectors and helped children adjust to the more demanding ways of a capitalist society. “You could say that I started the work to solve my own problems,” she said. 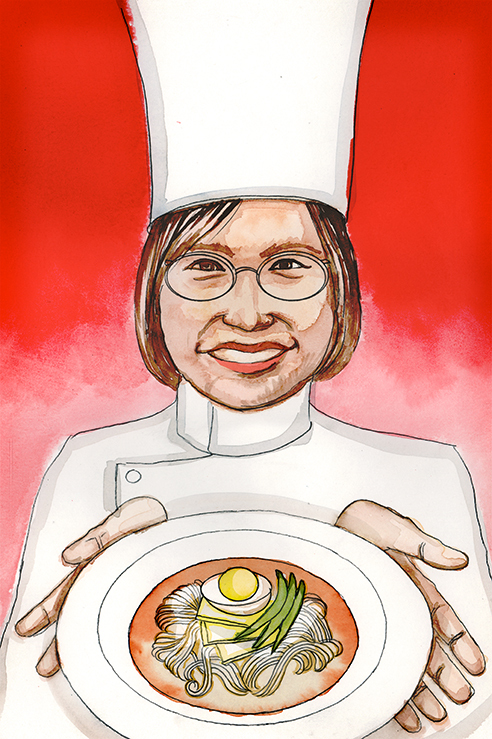 Lee founded the South’s first culinary institute for North Korean style cooking in order to preserve the many local recipes that North Korean themselves can no longer enjoy in their own country due to shortages of ingredients caused by poverty. Then came the North Korean restaurant Neung-ra Table, located on one of the oldest east-west thoroughfares of Central Seoul, Chongno. There she serves Naksadon Jeongol, a North Korean style chowder made with a boiled mixture of octopus, apple, and pork; or Pyongyang Onban, boiled rice served in chicken soup; or Haeju Bibimbop, rice served with chicken breast mixed with soy sauce instead of red pepper paste; or Eobok Platter, a kind of bouillabaisse prepared with meat. All are prepared without any additional or artificial flavors. Only soy sauce, red pepper paste, beef broth, garlic, and onion serve as condiments. But there is more to Lee’s ambition. 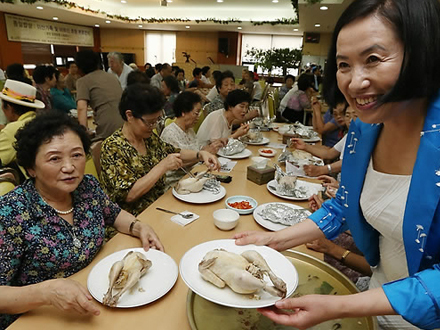 She now wants to bake a “Reunification Cake,” a wheat flour-honey cake baked in the traditional Kaesong style. She’s been baking it for a few years, but complains that she can’t increase production to satisfy the demand from customers. What is lacking are precious investment funds, she says. Lee rebels against defectors being kept dependent on subsidies and speaks up in favor of North Korean defectors starting small businesses like her restaurant in order to become self-reliant. She recognizes that defectors have their own problems when they arrive in the South because of the wide gap between the two cultures and economies. Attendance at work is one of them. This is why she feels that North Korean defectors themselves are the best intermediaries to help their compatriots adjust. “We are helping them to adjust gradually to the South Korean culture,” she says. “We dream of a unification where North Korean defectors can easily settle down through North Korean defector-run companies,” she says.